we do have a couple of coldwater profiles done by Mick. 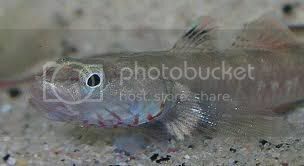 and are known as dwarf dragon gobies and are cold water fish and not as large or aggressive as the one you pictured. I will get a profile made up for those now. If you could start a new topic in freshwater chat Kasalaw if you want more help with compatibility help as this section is for profile help. I'll research which coldwater fish I can add as we are a bit lacking in that dept. Just done some research and i did my own request haha. Theres a page for Shubunkins, Black Moor and Comet. ...... Miiiiiick? Where are the killifish? Leave it with us and we will get to those for you.